Say hello to ‘Ber months! Since Christmas is just around the corner, Goods.PH Online Shopping Philippines is having Back-2-Back promos: PASKO NA, SANTA KO! And GOODS.PH AFFILIATE PROGRAM. Goods.PH Online Shopping Philippines is giving crazy deals, exciting giveaways, and more cashbacks with “Pasko na, Santa ko!” promo. 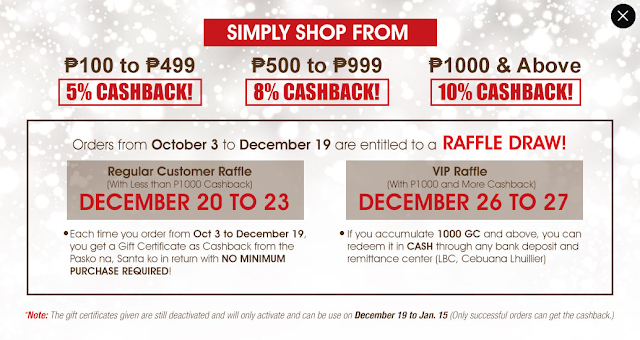 Have you heard about cashback? It’s when someone receives a cash refund upon making a purchase. Welcome to Goods.PH Affiliate Program where the challenge of earning extra income begins! Goods.PH will be your partner that connects to your own digital media like Blogsites, Facebook, Twitter, Instagram, Google+, Youtube or anywhere you want. Goods.PH affiliate program provides thousands of product choices that you can sell on your own platform with up to 30% commission for each product sold through your ads. Goods.PH affiliate Program showcases quality control products and deals at the most affordable prices and gives competitive benefits like profit, seminars, privileges and endless perks! Give EXTRA INCOME is what WE can do for you! Are you up for the challenge of making money with Goods.PH Affiliate Program? JOIN NOW! ‘Ber months is the season for Christmas countdown and it’s all about giving. Saving and earning money is a priority in order to purchase gifts for your loved ones. Therefore, Goods.PH Online Shopping Philippines is offering this ‘Ber Months Back-2-Back Promos to deliver you the happiness that comes from giving!